Where do I find my SNAP 2010 activation code? Your Snap 2010 activation code is on a blue card that is inserted in your book. You will need to tear off the paper tab to view the code which is hidden directly under the strip that you just pulled off. If your book did not come with one of these inserts, you can exchange it for a package that does at your place of purchase. If you are having trouble with the exchange, please have your place of purchase contact us via email at support@emcp.com or phone at 1-800-328-1452. If you received an invalid activation code error, make sure you are typing it correctly. Pay close attention to letters that may look like other letters i.e. “v” and “y” or “g” and “q”. You can order a SNAP activation code online here. Where do I find my SNAP 2010 enrollment key? The Enrollment Key to your SNAP course is provided by your instructor. If you attempt to create a SNAP account and do not have an Enrollment Key, you will see the message “enrollment key not found”. Contact your instructor for the Enrollment Key to your course. If you are getting a message that your Enrollment Key is invalid, make sure you are typing it in correctly. Where can I purchase a SNAP 2010 activation code? When will my SNAP 2010 activation code expire? SNAP 2010 activation codes do not expire. How do I setup my SNAP 2010 account? Go to www.snap2010.emcp.com home page. Click Student Registration in the New Student? section. Click Register for SNAP at the Student Registration page. Create a user name and password at the User Name and Password section of the New Account page. Fill in the appropriate information in the More Details section. In the Course Enrollment section, enter the following information: Enrollment Key: You will receive the enrollment key from your course instructor. Activation Code: You will find this printed on the User Guide activation code card. A Confirm Course Information page appears, listing your course and section name. If the information is correct, click Confirm Account. Click Continue to return to the SNAP 2010 login page. Click Check Configuration to confirm your computer has everything needed to run SNAP 2010 and install .NET framework 3.5.1 and the SNAP skill exam player if needed. Log in at the User Log-In section of the SNAP 2010 login page using the user name and password you created in Step 4. You will be taken to your SNAP Home page. Please verify the user name and password and make sure that the Caps Lock key is not on (user names and passwords are case sensitive). If you are linking to SNAP 2010 via a school website, security settings on the computer may interfere with the password submission process. The solution is to go directly to www.snap2010.emcp.com and then login again. Click the Forgot Your User Name or Password? link located underneath the User Name and Password area on the SNAP login page. Enter either your user name or your registered email address in the appropriate box. There is no need to enter both. Your login information will then be sent to the email address associated with your account. If all else fails, ask your instructor to email your user name and reset your password or email Technical Support at support@emcp.com for this information. Contact support@emcp.com to change your email address. How do I run the Check Configuration Tool? You can run the Check Configuration Tool from the SNAP 2010 Login Page. It’s a button towards the top of the website page. I receive an error that says Office 2010 is not installed. What should I do? Please confirm you have run the Check Configuration Tool (you can run this from the SNAP 2010 Login Page). Also make sure you have a registered version of Microsoft Office 2010 installed. You will need to open, edit & save a file in each Office application (Word, Excel, PowerPoint & Access) to ensure your exam will work properly. I receive an error that says Check Configuration 1406 (or error 1406 Skills Exam won’t launch). What should I do? How do I install Windows 7 on my Macintosh using BootCamp? 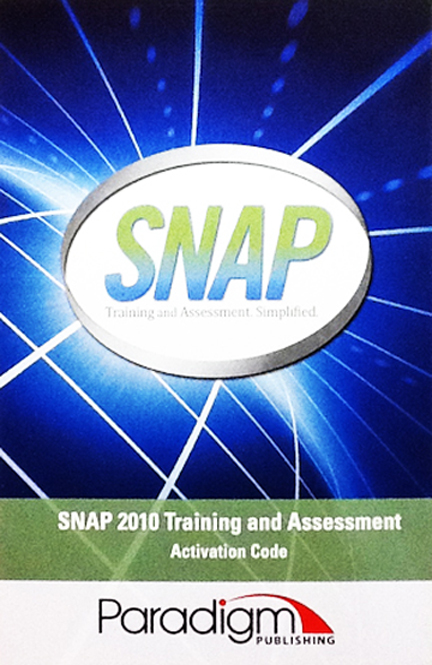 How do I add another course to my existing SNAP 2010 account, or retake a course? Click the Student Registration button in the New Student? section. At the Course Signup page, enter your user name and password. In the Course Enrollment section, enter your Enrollment Key for the new course. Log in at the User Log-In section of the SNAP 2010 login page using your user name and password. At your Home page, click the course name to view your new course. I enrolled in wrong course, what do I do? If you enrolled into the wrong course, but with the correct instructor, you should notify your instructor and ask to be moved into the correct course. If you enrolled into the wrong course with the wrong instructor, first contact the ‘wrong’ instructor and ask to be removed from the course. Then contact the ‘correct’ instructor and ask to be enrolled into the correct course. The course you are attempting to access has expired. To access a new SNAP course, you will need to register for that course. If you’ve already created a new SNAP account, then please verify that you’re using the login and password for your account. Your instructor can help verify that information if necessary. This message will occur if you launch the SNAP Player from your computer without using the SNAP website. 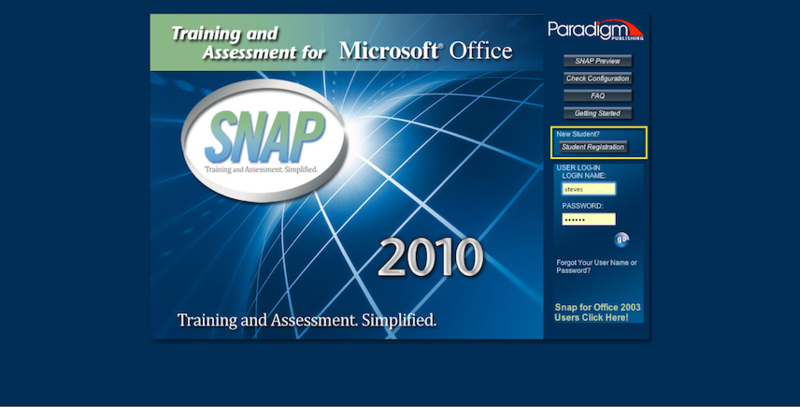 To launch the exam, log in to SNAP at snap2010.emcp.com and log in. Then find your assignment and open it from the website. The SNAP Player will launch and load the exam automatically if it is opened from the website. If you need to uninstall the SNAP player, you can do so by using the Windows Control Panel under the item “Programs and Features”. 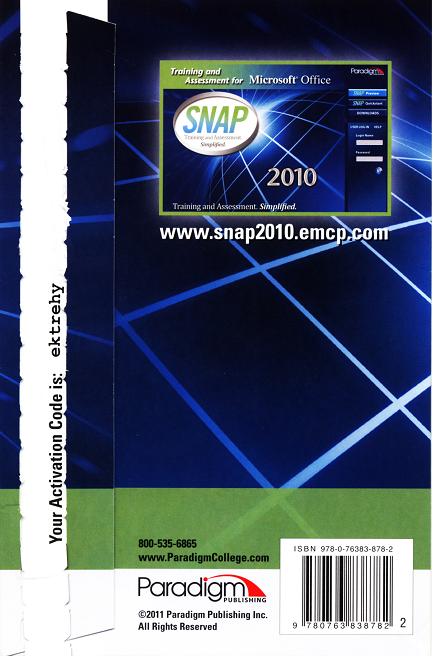 Note that uninstalling the SNAP Player will prevent you from executing performance exams until it is re-installed by running the configuration checker at snap2010.emcp.com. I have questions on the grading of my exam, what do I do? If your question is directly related to the grading of your exam, please first contact your Instructor for help. Why is the document I downloaded empty? If you downloaded a document that is empty, check the instructions for the assignment or assessment to see if they state that the document is supposed to be empty or verify with your instructor that the assignment that is intended to correspond with the document requires that the document starts empty. Some assignments or assessments require the student to start from a blank document. I can’t find my assignments. What should I do? It is possible that your instructor has not yet scheduled any assignments for your course. Contact your instructor to determine if he/she has indeed scheduled assignments. Verify with your instructor that you have enrolled in the correct course and section. How do I view my completed assignments? Click on “Past Activities” in the left hand side of the screen to view your completed assignments. Why am I having problems installing my Microsoft Office 2010 180 day Trial DVD? Purchase Microsoft Office Professional Academic 2010 Version click here. Note: Uninstalling any MS Office 2010 version you already have installed on your computer, will still not allow a successful installation of the MS Office 2010 180-day Trial DVD. The Webinar requires a specific WebEx media player be installed. To play the Webinar please download and install the .ARF player here.